Three UNB Saint John students were members of a top team that competed in the ACM International Collegiate Programming Contest 2014. 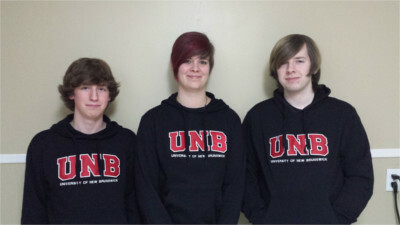 Brandon Smith, Jessica Blanchard and Alec Gordon, all Bachelor of Science Computer Science students placed second in the Science Atlantic Programming Competition held at UNB Saint John in October 2014, competing with 17 teams from the Atlantic region. The BitShift team then went to Acadia University to compete with the top teams in the 2014 Northeast North America Regional Contest including those from Harvard University and Massachusetts Institute of Technology. The Science Atlantic Annual Mathematics, Statistics and Computer Science Conference is an Atlantic Canadian conference for undergraduates, graduate students and faculty members from regional universities. UNB Saint John, the host in 2004, was pleased to again host the conference in 2014.